As the holidays draw nearer, we continue our short seasonal series of Christmas themed films that for one reason or another, despite their age, are now considered classics. Due to the surprising international success of the films Four Weddings and a Funeral and Notting Hill, screenwriter Richard Curtis was given the greenlight to complete his Christmas screenplay Love Actually Is All Around. 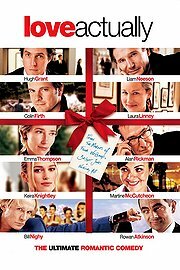 The title, originally based on the famous sixties pop song by The Troggs, Love Actually Is All Around, was eventually shortened to Love Actually, and, like the previous screenplays by Curtis, the film became an enormous hit. 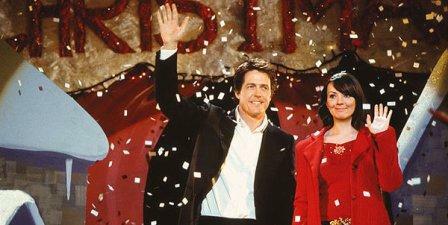 Released in the United States on 14th November 2003, Love Actually is a romantic comedy set in London at Christmas and revolves around not one but several different intertwining stories performed by an ensemble of first-rate character actors, including Emma Thompson, Alan Rickman, Keira Knightly and Hugh Grant among many others. For the record, the word ‘actually’ is spoken at least twenty-two times by various characters throughout the film. You’ll notice at the beginning and the end of the film the setting is London’s Heathrow airport where several passengers who have just disembarked from their various flights are met by their families and loved ones. These were all real people acting naturally, their hugs and embraces caught on film. Richard Curtis, who was also given directing duties, sent a team of cameramen to the airport and had them remain there for a week filming anything that looked appropriate to the theme of the story. Everyone who was caught by the camera was then asked if it was possible to use the footage for the movie. Perhaps one of the most amusing behind-the-scenes stories is that of actor Kris Marshall. Marshall played the part of a young guy called Colin who is convinced that the only way he will meet women who will appreciate him is if he flies to America, which is exactly what his character does. No sooner has he stepped off the plane – in Wisconsin, no less – when he meets three young American women who are immediately attracted to his London accent. They take him back to their apartment for a night of… well, you get the idea. Colin’s fantasy comes true. The story goes that Marshall had such a great time filming the moment when the girls undress him – a scene that required twenty-one takes until the actors got it right – that he actually gave back his pay-check for the day stating that because he had such a great time rehearsing the scene he was willing to do it for free! Whether it’s true is another matter, but it makes for a good story. Those who have seen the film talk of how the movie made them fall in love all over again; such is the power of this very funny and occasionally touching Christmas comedy. Though be warned if you haven’t yet seen it but you’re thinking of a rental to help you get into the Christmas spirit – Love Actually is adult in nature and earns its R rating. By all mean see it, you’ll have a great time, but keep the kids out of the room.